Agriculture and forestry, due to their direct dependence on climate and weather, are two of the widely studied sectors in the context of climate change. There are two aspects of climate change on agriculture: firstly, the potential direct effect of increased CO2 and secondly, the potential effects of changes in temperature, precipitation. The changes in climate parameters could also have an influence on factors constraining their growth such as soil quality, pests, and diseases. Either in the past or at present, a number of the studies capture impacts due to change in average climate. It is widely believed, however, that changes in climate variability would imply much larger impacts than those due to changes in average climate alone. Agricultural production in lower-latitude and lower-income countries is more likely to be negatively affected by climate change (IPCC, 1996, 1998, 2001). It is seen that climate variability and climate change, particularly in terms of frequency/intensity of droughts, have larger impacts on the sub-humid than on the humid regions. If climate variability induced disasters become more common, widespread, and persistent, many countries in the sub-humid and humid tropical regions may have difficulty in sustaining viable agricultural and forest practices. Increasing atmospheric CO2 levels could elevate the photosynthetic rate and stimulate plant growth and will generally be beneficial to the crop and forest in the humid and sub-humid tropics. In general, it is expected that areas in mid- and high-latitudes will experience increases in crop yield; yields in lower latitudes generally will decrease (IPCC, 2001). The response of crop yields to climate change varies, depending on the species, cultivar, soil conditions, CO2 direct effects, and other locational factors. Based on TAR, there is high confidence that, in the tropics, where some crops are near their maximum temperature tolerance, yields would decrease generally with even minimal changes in temperature; higher minimum temperatures will be beneficial to some crops, especially in temperate regions, and detrimental to other crops, especially in low latitudes. Degradation of soil is one of the major future challenges for tropics agriculture. It is established with high confidence that this process is likely to be intensified by adverse changes in temperature and precipitation. But another important advance in research on the direct effects of CO2 on crops suggest that beneficial effects may be greater under certain stressful conditions, including warmer temperatures and drought. So that would be a positive aspect for agriculture. Globally, the economic impacts of climate change on agriculture are expected to be relatively minor, decreasing food production in some areas will be balanced by increases in productivity in others (Rosenzweig and Parry, 1993; IPCC, 2001). However, based on TAR, the adaptive capacity of human systems in Africa, Asia and Latin America is low and vulnerability is high. Changes in average climate conditions and climate variability could have significant effects on agriculture in many parts of the humid and sub-humid tropics. Agriculture in these regions, particularly in the sub-humid areas, is vulnerable to many environmental hazards -including frequent floods, droughts, tropical cyclones and storm surges and high temperatures. Low-income rural populations that depend on traditional agricultural systems or on marginal lands are particularly vulnerable (Amadore et al., 1996). Table III shows excerpts of a table of recent studies of yield and production in selected countries in the humid and sub-humid regions. Food security is facing a threat because there would then be rapid changes in supply and demand structures most especially in the developing countries, especially in the tropics. Assessments of the consequences of climate for the number of people at risk of hunger as defined by the Food and Agriculture Organization (FAO) have also been done. Results of the study by Parry et al. (1999) indicate that the additional number of people at risk of hunger as a result of climate change by 2080 is estimated to be about 80 million and those at higher risk are from the arid and sub-humid tropics. Maize, rice, wheat, coarse grains, soybean, "cash crops"
Per capita food production in Africa, as a whole has already decreased over the recent years. Food security in Africa is affected severely by extreme events, particularly flood and droughts. For example, the 1998 ENSO floods had wrought extensive damage to crops in Kenya which was estimated at US$ 1 billion (Ngecu and Mathu, 1999). Irrespective of whether climate change will cause more frequent or more intense extreme events, it is seen that agricultural productivity is sensitive to climate hazards such as droughts and floods. The already deficient food production in many areas of Africa could result in worsening the problems of food security. The TAR further cites some specific examples of impacts on crops here. Among these are the studies done by Pimentel (1993) that indicates that global warming is likely to alter production of rice, wheat, corn, beans and potatoes which are major food crops in Africa and by Odingo (1990) that notes that rice may disappear because of higher temperatures in the tropics. Projections indicate the dominant impacts of increase in temperature which show decreases in growing season and reduction in runoff. And although increased CO2 could increase photosynthesis rates and water use efficiency in crops like wheat, rice and soybeans, increased temperatures could have deleterious effects on crops during sensitive development stages which could lead to a decline in grain yield and quality. In addition, the risks of adverse effects on agriculture in the sub-humid areas of the region with more frequent and prolonged droughts could also be considerable (IPCC, 2001). There is a consensus in all IPCC assessment reports (1996, 1998) that climate variability and climate change (primarily droughts) would generally have significant impacts on almost all farming systems in Africa. The most significant constraint for African agriculture is water supply. Due to the relatively rich water sources, climate change and variability would lead to less impacts on the agriculture in humid and sub-humid Africa, compared with other areas in Africa. According to TAR, the developing countries of temperate and tropical Asia already are quite vulnerable to extreme climate events such as floods, typhoons/cyclones, and droughts. Climate change and variability would exacerbate these vulnerabilities with high confidence. Increased precipitation intensity, particularly during the summer monsoon, could increase flood-prone areas. There is potential for drier conditions in sub-humid Asia during summer, which could lead to more severe drought (medium confidence). The expected increase in the frequency and intensity of climatic extremes will have significant potential effects on crop growth and agricultural production, as well as major economic and environmental implications. The IPCC (2001) has defined a number of vulnerabilities of the agricultural productivity in Asia. Asia is a region in which climate-change-induced vulnerabilities are highly dependent on the population density and rate of economic growth in each of the countries. The growth rate of rice production in a number of countries such as Philippines, Indonesia and Sri Lanka has been unable to match, much less cope with fast population growth rate due to a number of factors which includes the impacts of a highly variable climate. Food insecurity also appears to be the primary concern for Asia. The variability of rainfall in the developing countries of tropical Asia is rather high so that these countries have also been rendered quite vulnerable to extreme climate events such as droughts and floods. Moisture stress due to prolonged dry spells/droughts and in some sub-humid areas, coupled with heat stress, have already been seen to affect crops, especially when these environmental conditions occur during the critical stages of the crops (Rounsevell et al., 1999). On the other hand, excessive moisture also causes substantial crop losses due to floodings and loss of nutrients and soil erosion. The predicted increase in frequency and/or severity of extreme events could further exacerbate adverse impacts. Furthermore, all climate scenarios point to an increase in area-averaged annual mean precipitation over its entire region which could lead to increased frequency and severity of floods. So, it is seen that agricultural productivity in this region could suffer severe losses. Results also show that increasing minimum temperatures could have an impact on rice yields while wheat crops are likely to be sensitive to increases in maximum temperatures. The adverse impacts due to temperature increases could also be further exacerbated by the occurrence, development and spread of crop diseases because some common diseases such as wheat scab, rice blast, and sheath and culm blight of rice could be more widespread as a result of warmer and wetter climates. Ninety percent of the more than 10,000 different species of insect pest found in the tropics are active in the humid areas. Higher temperature during winter is highly favorable to pathogen survival rates. Source: Water, Air and Soil Pollution, vol. 92.
of climate change (Wijeratne, 1996). The Howden et al. (1999) study, however, as reported in the TAR indicate that deleterious effects of higher temperatures could be offset for cropping systems with growth in the cooler months. And, it also appears that there is greater relative enhancement of growth due to increased CO2 under drier soils. Extremes in climate variability already severely affect agriculture in Latin America. There is high confidence that a decreased yield for numerous crops (e.g., maize, wheat, barley) is projected, even when the direct effects of CO2 fertilization and implementation of moderate adaptation measures at the farm level are considered (IPCC, 2001). The largest area with marked vulnerability to climate variability in Latin America is northeast Brazil. Periodic occurrences of severe El Nino-associated droughts in northeastern Brazil have resulted in occasional famines (Hastenrath, 1993; Kovats et al., 1999; IPCC, 2001). The Rosenzweig et al. model simulations indicate that any change in climate could mean major consequences in northeastern Brazil. Under doubled-CO2 scenarios, yields are projected to fall by 17-53%, depending on whether direct effects of CO2 are considered. under enriched CO2 scenarios in some areas. The assessment done on wheat, maize and soybean production under doubled-CO2 scenario in Brazil by de Siqueira et al. in 1994 predicted declines in yield for the first two crops and -10 to +40% yield for the last one as shown in Table V which summarizes assessments of climate change impacts on annual crops in Latin America. Information about some cash crops in countries of the Central American isthmus indicate that under current climate conditions, the productivity of banana crops is severely affected particularly in flood-prone areas. These crops could be additionally stressed if climate change-induced variability includes increasing frequency of storms and precipitation (IPCC, 1998). In addition, for some tropical inlands such as Cook Islands, the possible changes in climate parameters could affect some species/cultivars of crops such as papaya, citrus, and vegetables, which are more sensitive to climate. Increase in sea level can dramatically affect the Islands. They may see greater flooding of by seawater and can cause major damage of agricultural production. It should be considered, however, the impacts of climate change and variability on agriculture remains uncertain on some extent, not only because of uncertainties in climate projections, but also because the agronomic and economic models used to predict these changes are not perfect. Some models do not include changes in insets, weeds and disease; changes in soil management practices; changes in water supply. Moreover, the magnitude and persistence of effects of increased CO2 concentration on crop yield under realistic farming conditions, and other uncertainties. Climate affects livestock in four ways; through the impact of changes on availability and price of feedgrain, impacts on livestock pastures and forage crops, the direct effects of weather and extreme events on animal health, growth, and reproduction, and changes in the distribution of livestock diseases. For developing countries, the impact of climate variability on livestock is generally negative in the humid and sub-humid tropics, particularly in the latter. For animals, heat stress has a variety of detrimental effects, with significant effects on milk production and reproduction in dairy cows, and swine fertility (Berman, 1991; Hahn and Mader, 1997; Hahn, 1999). Moreover, warming in the tropics during warm months would likely impact livestock reproduction and production negatively (e.g., reduced animal weight gain, dairy production, and feed conversion efficiency) (Klinedinst et al., 1993). Impacts, however, may be minor for relatively intense livestock production systems. Range-fed livestock in any African region is dependent on annual precipitation. Any change in mean annual precipitation is expected to have a negative impact on pastoral livelihood. Livestock distribution and productivity could be indirectly influenced by the changes in the distribution of vector-borne livestock diseases (Hulme, 1996). Livestock in humid areas in Africa are prone to diseases such as those carried by the tsetse fly. With warming, its distribution could extend westward in Angola and northeast in Tanzania but with reductions in the prevalence of tsetse in some current areas of distribution. In areas with high moisture content, animal productivity is limited by the protein content of the fodder (Ellery et al., 1996; IPCC, 2001). Protein availability will not increase with the increase in rainfall or the CO2 concentration, hence livestock would not respond to the direct effects of climate change. Additionally, since even the domestic livestock should be under a certain climate environment for optimal performance, any change that could alter the limits of this climate environment could have an impact on the meat and milk production. There is very little literature on impact of climate variability and climate change on livestock production in tropical Asia. However, because of the increasing trend for meat consumption, there is a higher demand for livestock feed. Production of feed grain in Asia, especially maize, is adversely affected by climate variability and climate change. Livestock productivity is also highly dependent on the climate environment. Any change that is beyond the limits of the optimal climate environment would impact livestock production. Livestock in much of Latin America is raised in rangelands. It is predicted that its production would be negatively affected by increased variability of precipitation since those areas which are drought/flood-prone would be severely affected. Compared with animals, pastures in the sub-humid tropics are more vulnerable to the climate variability. Rangelands are noted for high climatic variability and high frequency of drought events. They have a long history of human use. The combination of climatic variability and human land use make rangeland ecosystems more susceptible to rapid degeneration of ecosystem properties (Parton et al., 1996). Seasonal water availability and chronically low soil-nutrient availability appear to be the most limiting factors in the pasture of the region (Solbrig et al., 1992). In addition, the already low nutritional value of most tropical grassland and savannas may decrease as a consequence of increased C:N ration (Oechel and Strain, 1985; Gregory et al., 1999). Thus, the carrying capacity for herbivores may be reduced. For example, because of an alteration in the amount and pattern of rainfall, the occurrence of extreme events (e.g., hurricanes, drought), and the ENSO which could become more frequent and bring more severe weather under the 2 x CO2-climate, the northern South America savannas could fail to function as they do now (Aceituno, 1988). Tropical forests cover about 1.9 billion ha of the world's surface, representing about 40% of the world's forested area. They contain more than half of all plant and animal species. The impacts of climate change on forests includes to effect forest physiological processes, geographical distribution and biodiversity. There are different impacts of climate change on forests; some are likely to be detrimental while others can be beneficial. When considered separately, temperature increases could have direct effects on plant growth by changing photosynthesis and respiration rates, and plants can tolerate even extremely high temperatures, provided sufficient water is available (Kirschbaum, 1998). Increasing CO2 concentration can increase photosynthetic rates and this effect is more pronounced in C3 plants at higher temperatures and under water-limited conditions. For different combinations of increases in temperature and CO2 concentration and for systems primarily affected by water and nutrient limitations, different overall effects on plant productivity could be expected. Most tropical forests are likely to be more affected by changes in soil water availability (e.g., seasonal droughts). Some evergreen species of the humid forest clearly will be at a disadvantage in areas that experience more severe and prolonged droughts. Significantly, drought affects the survival of individual species; those without morphological or physiological adaptations to drought often die. Species in moist tropical forests, including economically important hardwoods, are the least drought-adapted in the tropics, and their survival in some areas must be considered at risk from climate change. Droughts would favor forest fire; therefore, with a likely increase of droughts, the incidence of forest fires may also increase. Humid and sub-humid tropical forests contain large numbers of insects and pathogens that can cause serious damage to some plant species and may play a role in regulating species diversity. Based on FAO (1997), insect and disease outbreaks are reported mostly for plantation forests; although relatively less is known about these in native forests. Many factors have been associated with the susceptibility of tropical plants to pest and diseases and with the virility of pests and pathogens. Drought stress can sometimes increase host plant suitability, whereas high temperatures and humidities can decrease the growth rate, survival, and fecundity of some insects (IPCC, 1996). Consequently, there is still great uncertainty as to whether the impacts of climate change on the relationship between host plants and pests and pathogens will lead to forest loss or gain. However, studies show that climate variability also has positive effects on forests. Strong winds associated with tropical cyclones frequently damage tree canopies, but also create gaps in the forest, and modify the forest structure and micrometeorological environment. This may allow more radiation to reach the forest floor, increase soil temperature, and make more soil water and nutrients available, which could promote the growth of new vegetation (IPCC, 1996). The effects in fertilization of elevated CO2 concentrations are also beneficial to sub-humid and humid forest. In addition, it should be noted that although climate variability would generally have some negative effects on forests of the humid and sub-humid tropics, the impacts of human activities such as deforestation will be more important than climate change and climate variability in determining natural forest cover. It has been seen that the main causes of deforestation in tropical region are population resettlement schemes, forest clearance for large-scale agriculture, demands of forestry production, and, in particular, shifting cultivation. The rate of deforestation had been highest in Africa (1.7%), followed by Asia (1.4%) and Latin America (0.9%). The areal extent of deforestation, however, was highest in Latin America (7.3 million ha), followed by Africa (4.8 million ha) and Asia (4.7 million ha) (National Research Council, 1993). The moist tropical forests of the Congo constitute the second most extensive rainforest in the world. 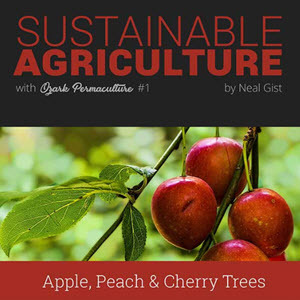 A large fraction of the population lives in rural areas, totally dependent on trees and shrubs for their subsistence. Climate change could render vulnerable this large part of the African population. • Dry sub-humid areas have experienced declines in rainfall which result in decreases in soil fertility and range, and forest production. • Untested assumptions are the transformation of parts of Africa, largely in the sub-humid tropics, into pastures. Increased cattle production means more tree-cutting, which could lead to a number of cascading effects. • The desertification during the last half of the 20th century have caused a 25-30 km southwest shift in Sahel, Sudan and Guinea vegetation zones at an average rate of 500-600 m per year. This rate could increase further in a CO2-induced climate change (Davis and Zabinski, 1992; IPCC, 2001). • Dry woodlands and savannas in sub-humid areas could be subjected to more drying as climate change leads to increasing temperatures. Risks from vegetation fires could also be exacerbated. • Geographical shifts in the ranges of individual species and changes in productivity are the most likely impacts of CO2-induced climate change. Research in countries like Senegal has confirmed the retraction of mesic species to the areas of higher rainfall and lower temperature. Meanwhile, simulations of forest species distribution in Tanzania and the Gambia indicate changes from mesic to xeric vegetation in these two countries (Jallow and Danso, 1997). Floristic biodiversity hotspots could be threatened by shift in rainfall patterns and these include the mountains of Cameroon, the island-like Afromontane habitats that stretch from Ethiopia to the higher latitudes of Africa at altitudes above 2000 m (Mace et al., 1998). Montane centers of biodiversity could be rendered at risk by increases in temperatures because there could be no possibility of migration. In the developing countries of Asia, sensitivity of natural systems like forests is linked to the projected climate change-induced impacts, the degree to which natural systems have been degraded and the unsustainable utilization of resources. Examples are the increased risks of uncontrolled forest fires due to the conversion of natural forests to palm oil plantations in a number of Southeast Asian countries (e.g., Indonesia). Increase in population often result in the conversion of forest lands to cultivation and more intensive farming. There are also expected impacts on soil erosion, fertility in the soils, depletion of water resources and genetic variability of crops (Sinha et al., 1998; IPCC, 2001). As many as 16 countries of tropical Asia are situated within the humid tropical forest region. Climate change is expected to affect the boundaries of forest types and areas, primary productivity, species population and migration, the outbreak/incidence of pests and diseases and forest degeneration in these countries. More than 50% of the world's terrestrial plant and animal species are in the frontier forests in Asia. There already are trends of increasing risks to this rich array of living species being seen in China, India, Malaysia, Myanmar and Thailand partly due to the degeneration of their habitat (IPCC, 2001). Since distribution of species is limited to a narrow range of environmental conditions, there are possibilities that climate change could change these conditions which could result in it being unsuitable. This could cause the loss of a large number of unique species that currently inhabit the world's tropical forests (Kirschbaum, 1998). With climate change, the distribution of suitable habitat will change. Species will respond individually and differently to environmental changes. For some species, a temperature increase of even 2 °C can change the environment from being suitable to totally unsuitable (Bazzaz, 1998). Species with narrow tolerances are likely to be lost at the expense of species with broader tolerances. For tropical forests, this could lead to the loss of many of these unique species at the expense of those that can tolerate the new conditions or species that have the potential to invade newly suitable habitats (Phillips, 1997; Bawa and Dayanandan, 1998; Bazzaz, 1998) and ultimately, species composition of forests could change. 1995). Large areas of undisturbed forests are being impacted by removal of wood for timber and fuel (Brown et al., 1997). In addition, there are pressures on them through increasing incidence of wildfires (Goldammer and Price, 1998) and ecological threats through habitat fragmentation (Skole and Tucker, 1993) and selective removal of indigenous or introduction of exotic species (Phillips, 1997). 1996). 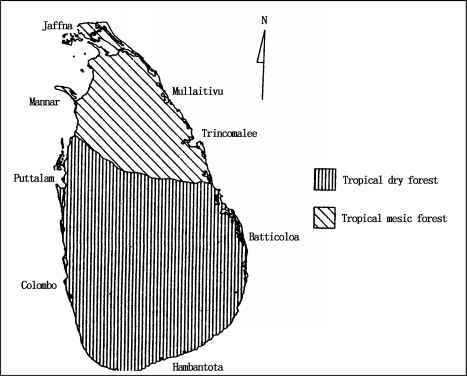 Areas of tropical dry forests would appear and there could be an increase in tropical moist and tropical wet forests. A northward shift of tropical wet forests into areas currently occupied by tropical dry forest is also being predicted due to climate change-driven increases in temperature and rainfall in the northern part of the islands. Table VI shows the areas of major forest types in Thailand under current and changed climate conditions. Source: Water, Air and Soil Pollution, vol. 92. Values given in parentheses are percentage. simulations using the Holdridge Life Zone Classification with current climate and climate scenarios are shown in Figures 2a-2c. There have also been a number of natural and human activities that have borne adverse impacts on the forests of Latin America. These could be exacerbated by climate change-driven impacts. A continued conversion of large areas of humid tropical forests to pasture/agricultural activity could reduce water cycles and precipitation in the region. There is high confidence that if extent of deforestation in the Amazonia expands to substantially larger areas, reduced evapotranspiration would lead to less rainfall during its dry periods. If this dry period becomes larger and more severe, it could have deleterious impacts on the forest. Many trees could die due to increased water stress. Greater severity of droughts coupled with deforestation could lead to erosion in what remains of the forests in this region. Moreover, occasional severe droughts likely to occur during the El Ninos would kill many trees of susceptible species and would result in a replacement of tropical moist forests with drought-tolerant species (Shukla et al., 1990). Additionally, it is being projected that human action could now turn even less intensive El Niño events into catastrophes in terms of forest fires because there already have been considerable incursions of these fires into standing forest in the eastern Amazonia during dry years. Previously, burning in the Amazonia forests had been limited to where trees had been felled and the fire had previously stopped upon reaching the edge of the clearing. Amazonia forests is still not known. But as a consequence, forest composition could be altered. Globally, climate-driven scenarios at doubled-CO2 concentration point to 1015% expansion of the area that is suitable for tropical forests with tropical rainforests expanding from 7 to 40% (Solomon et al. ), but these simulations have not, however, taken into consideration the influence of human populations. By and large, the combination of forces responsible for continued deforestation may not at all allow tropical forests to expand; although one particular model, which includes climate and human changes, has indicated decreases in forest areas in Latin America by about 5% by 2050 (Zuidema et al., 1994). And for plantation forestry, a major land use in Brazil, climate change could reduce silvicultural yields due to changes in water availability, spawning adverse impacts on pests and fire hazards. Figure 2. 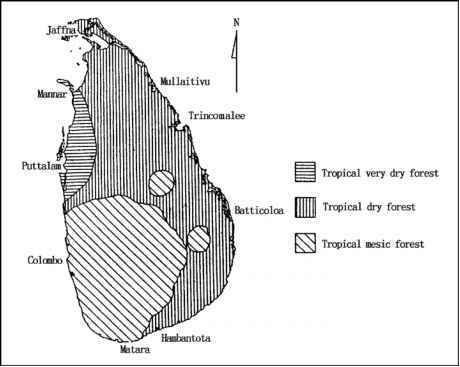 (a) Holdridge life zones of Sri Lankan forests under current climate conditions. 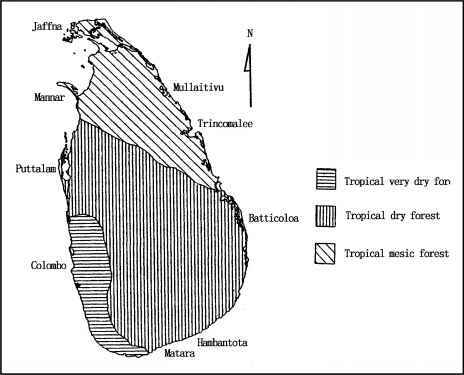 (b) Holdridge life zones of Sri Lankan forests under CCCM derived climate change scenarios. (c) Holdridge life zones of Sri Lankan forests under GFDL derived climate change scenarios. forest is threatened by the combination of human disturbance, increase in fire frequency and scale, and decreased precipitation from evaportranspiration loss, global warming, and El Niño. Philippines lies at the western rim of the Pacific Ocean and just off the southeastern portion of the Asiatic continent. It consists of approximately 7100 islands and islets distributed over an area from 4.7 to 22.50N and about 117 to 1270E. It has relatively warm temperatures and mean annual rainfall ranging from 2000 to 4000 mm. Extreme climate events consist an inherent component of Philippine climate system and natural hazards due to these extreme events are strong winds, storm surges, floods, and droughts. And like its neighboring countries, it is much affected by ENSO events. million ha, 45% of which is located in lowlands and 33% in the uplands. Rice and corn, being the country's staple food, remain its most important crops. Coconut, sugarcane and some cash crops like bananas constitute important export commodities. Rice production plays a dominant role in Philippine agriculture and its economy as a whole. Rice production growth rate has been pegged at 2.33% annually. However, population growth rate has been estimated to be 2.4% per annum, so that Philippines will most likely continue to depend on rice imports for about 5% of its national requirements. There are also a number of non-climate factors which could affect the degree of vulnerability of the sector. These include population growth, land use conversion that leads to depletion of agricultural/riceland areas, inadequate development of irrigation facilities, deterioration of agricultural resources and the country's entry into international economic agreements. Figure 3. Gross value added in four principal crops at constant 1985 prices. intermediate outputs or value of goods and services such as raw materials and supplies, fuel, etc. used in the production process during the accounting period estimated at constant 1985 prices) and in volume of production in four principal crops namely rice, corn, sugarcane and coconut, generally coincide with El Niño years; while the increases concur with La Niña years (see Figure 3). Sharpest falls in GVAs and volume of production in the agricultural sector had been in 1982-1983 and 1997-1998, the periods, which saw the birth, peaks and decay of the two strongest El Niños of the 20th century. On the other hand, increases in GVAs in rice and corn had been attributed mainly to favorable rainfall conditions during the La Niña years. • Livestock and poultry as a sub-sector had not been sensitive to extreme climate events as shown in Figure 4; although, at the farm level, there could have been impacts of climate variability/extreme events. • Some third-order impacts had also been indicated such as shortfalls in the projected annual economic growth due to dips in the agricultural growth rates, increased burden on urban resources as a result of the migration of displaced agricultural workers to the cities for jobs and/or increased dependence of these workers on government aid, worsening poverty situation, etc. Figure 4. Gross value added in poultry and livestock at constant 1985 prices. production losses; and there would be more declines in crop yields if frequency and intensity of El Niño events increase. Incidence of pests and diseases is also likely to increase and could cause more negative impacts. Tropical cyclones would diminish food security if their intensities and peak winds increase. There would be more consistent yield losses from climate change if no adaptation measures are put in place. However, there could be increases in rice yields, provided correct management and farm practices are put in place. Vulnerability assessments done on rice and corn production using global circulation models (GCMs) to give simulations of climate change scenarios and process-based crop models gave varied results. Simulations showed, generally, increases in rice yield except for those scenarios generated by the GISS model, but decreases in corn yield (Centeno et al., 1995; Buan et al., 1996). Assessments done by Escaño and Buendia at the International Rice Research Institute, as part of the Rosenzweig and Iglesias study in 1994 gave varied results. Changes in rice yields varied from a decrease of 21% to an increase of 12%, depending on the GCM and the site used. Results of the simulations employing adaptation options showed adaptation was unable to mitigate losses. The Centeno et al. study simulated potential rice yields in 16 sites using the ORYZA1 rice crop model under various scenarios of changed climate. Results were a yield increase of about 30% at doubled-CO2 with no temperature increment, decreased yields with increasing temperatures but at current levels of CO2 and more pronounced decreases during the dry season due to the already high temperatures, usually prevailing during this period, and decreases in yield in all increments of CO2 concentration in both seasons and with a +4 °C increase in temperature. The projected rice yields over all sites and all seasons under climate change were computed. Overall, it was predicted that the national rice production of the country would change by +6.6, -14.0 and +1.1% for the GFDL, GISS and UKMO doubled-CO2 scenarios respectively as could be seen in Table VII. Further analysis was done using a number of adaptation strategies which include changing planting dates, applying irrigation, employing more site-specific fertilizer management, etc. For rice, yields would definitely increase when planted in some suitable times of the year, especially with the application of irrigation and the more site-specific crop and soil management. Corn yield, however, would be more negatively affected. These simulation results, however, could only serve as a range of what could be expected inasmuch as there are inherent limitations in the climate scenarios and in the process-based crop models used. For instance, the Buan et al. (1996) model did not consider the effect of extreme climatic events, including that of strong winds due to tropical cyclones. Moreover, one of the assumptions made was that the soil conditions during the simulations are the same even when CO2 is doubled. What is certain though is that when the agricultural sector in any local area has already been rendered vulnerable by increasing climate variability, including occurrences of extreme events, and other non-climatic factors like increasing population, diminished/degraded agricultural areas and ineffective/insufficient agricultural support services such as lack of irrigation facilities, the projected adverse impacts will certainly contribute to decreases in crop yield. 5.4.1.3. Impact of Climate Variability on Philippine Forest Resources. Philippine forests can equal any of those in many areas of the tropics in terms of diversity. Indigenous flowering plants are estimated to be around 8000 species, belonging to almost 6500 genera and 20 families. They contain quite a diverse collection of plants and animals; thus, there is a gene pool of living organisms with a value that could exceed much beyond its current market price. Forest-based industries used to constitute a major contributor to the country's GNP for three decades from the 1950s until the 1970s. With the massive deforestation that had taken place over a number of years, its contribution had come down to only 0.18% in 1995. Yet, it remains a major source of income for many upland dwellers, including a good number of indigenous tribes. More than 9 million people are estimated to inhabit the forestlands, where they marginally subsist through cultivation and utilization of the already degraded forest resources. Forest-based industries continue to generate more than 300,000 employment opportunities, not including those who are employed in downstream industries. Any further deterioration of the forest resources is certain to diminish these opportunities and will not augur well for those who inhabit these lands and depend on them for subsistence. Results of the study done by Cruz, in 1997, indicated that forest resources which are already highly vulnerable are timber, water and biodiversity. Timber resource is already highly depleted due to a number of pressures. Among these is climate variability, both directly and indirectly. For example, excessive floods have caused soil erosion which ultimately has degraded the land. Also, when man gets little harvests from upland cultivation, he is driven to scavenge wood products/wood which could augment his income. Similarly, water resource has been highly degraded due to the denudation of watershed forest cover. Many watersheds are already suffering from non-climate factors like destructive cultivation, encroachment and improper management, and from climate-related pressures such as excessive soil erosion and surface runoff due to floods. Biodiversity in many of the country's forested areas may have been affected by natural variability of climate because prolonged dry periods may have threatened some species. When climatic factors combine with untenable practices like excessive logging and lack of protection and unsustainable management, then local biodiversity becomes at risk. Forest boundaries in the country may also have been changed due to prolonged dry periods during El Nino events. Droughts have been known to cause significant damages to the productivity and biological integrity of forest ecosystems. Furthermore, the documentation and analysis of impacts of extreme climate events on the environment sector (PAGASA, 2001) indicate that forest fires due to El Nino events pose a threat to the remaining forest reserves. Figure 5 shows the forest fire destruction in the country. Areas damaged by forest fires were extensive during the 1982-1983, 1991-1992 and 1997-1998 El Nino events because of the prolonged dry spell.